Every organization has certain way of driving or operating its business. Typically tools such as emails, notice board, meetings, announcements might be used to conduct and communicate these business processes. As organization grows, it needs to formalize its processes to bring consistency across department, across projects. Take an example of project approval process: in smaller companies, verbal consent might be taken as an approval to take up new project or to decide whether to do a given activity or not. The same mechanism will not be accepted in larger organization; wherein formal, multi-level approval might be needed before kicking-off a project. More often than not, people equates any new/formal process as bureaucratic process as it may delay the decision making or without realizing that existing project management process is broken. And employees have not-so-liking towards formal processes primarily because of the delay involved in the decision making. However at the same time, it is important to understand that right process ensures things are not falling through cracks, the thought processes and elements involved in the project approval process stick to quality, budget, profit, ethical guidelines and standards. It ensures predictability and consistency in doing business and is certainly a plus from customers’ perspective. There is also an important element of project governance organization has to consider to reduce risks involved in project management process. The biggest plus using ZilicusPM project management system is, organization can formally enforce project review/approval process. It is transparent to requester and reviewer, meaning they know who is requester, who is approver, what is the current status of request, what are the review comments, when it was created, when it was rejected, when it was approved, etc. This information is also communicated via email to respective project manager, portfolio manager involved. 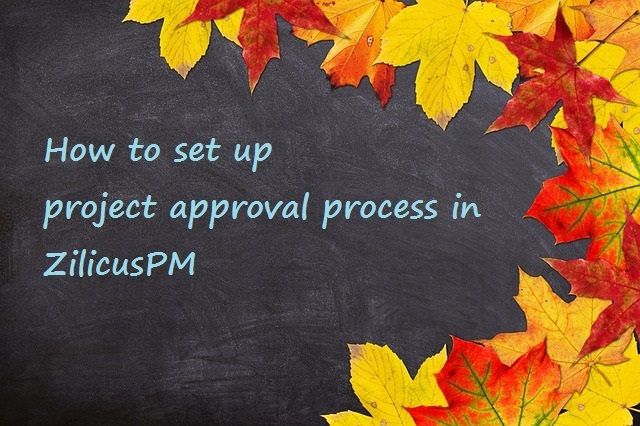 In this post, let’s look at how to set up a simple project approval process using ZilicusPM. Once you have clear understanding of above, it becomes mandate for project approval process using ZilicusPM across the board; everyone is expected to follow the same. As organization decide to have project review and project approval process for every new project requested, you can ask account administrator to enable the project approval process for your ZilicusPM account. What they have to do? Whatchanges they have to expect as approval process in enforced? What it means to the status of newly created project? What it means for project schedule created? How resources are informed until the project is pending for approval? As far as ZilicusPM is concerned, as project approval process is enabled, every new project request puts the project in “Planning” state. All the tasks created, resources assigned to those tasks are not visible to team members (only project creator and reviewer can view project workspace). Not that you will have to hand-hold project and portfolio manager for this process change certainly if there are elements they might struggle with, you can help them understand how to view new project request, how to drill-down/open the project request or check the details of new project request. Subsequently they will have to understand how to approve, reject, or pass the review comments to project requester. Through-out all these steps, project and portfolio managers are well informed via email. So it is unlikely that they will not notice new project request or if project request is approved/rejected or more information has been asked for. As an organization once everyone starts adhering to such common principles and guidelines, your project management process becomes more consistent and predictable. It can even get ready for better/mature business. It helps business leader to take informed decisions. Let me know if you have anything to add to the project approval process.